Ever noticed how or wondered why people sound different on your cell phone than in person? You might already know that the reason is because a cell phone doesn’t transmit all of the sounds that the human voice creates. Specifically, cell phones don’t transmit very low-frequency sounds (below about 300 Hz) or high-frequency sounds (above about 3,400 Hz). The voice can and typically does make sounds at very high frequencies in the “treble” audio range (from about 6,000 Hz up to 20,000 Hz) in the form of vocal overtones and noise from consonants. Your cell phone cuts all of this out, however, leaving it up to your brain to “fill in” if you need it. Figure 1. 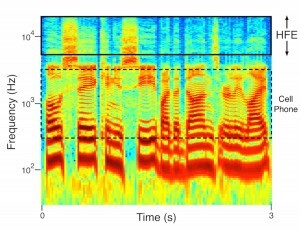 A spectrogram showing acoustical energy up to 20,000 Hz (on a logarithmic axis) created by a male human voice. 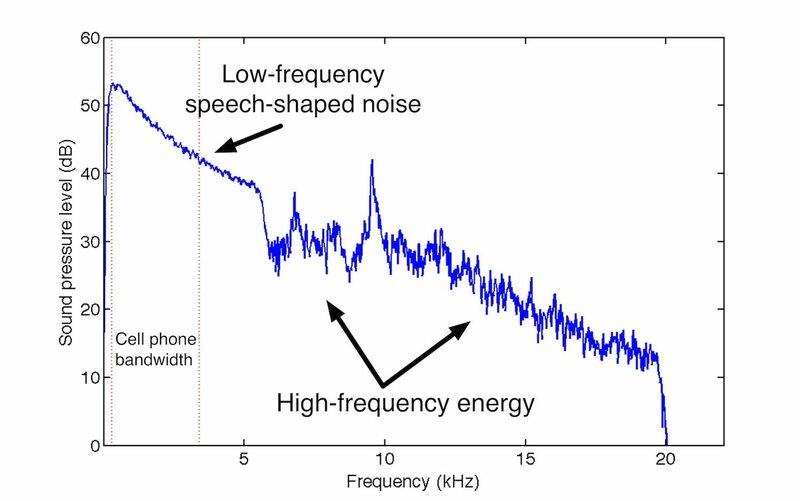 The current cell phone bandwidth (dotted line) only transmits sounds between about 300 and 3400 Hz. High-frequency energy (HFE) above 6000 Hz (solid line) has information potentially useful to the brain when perceiving singing and speech. Until recently, these treble frequencies were only thought to affect some aspects of voice quality or timbre. If you try playing with the treble knob on your sound system you’ll probably notice the change in quality. We now know, however, that it’s more than just quality (see Monson et al., 2014). 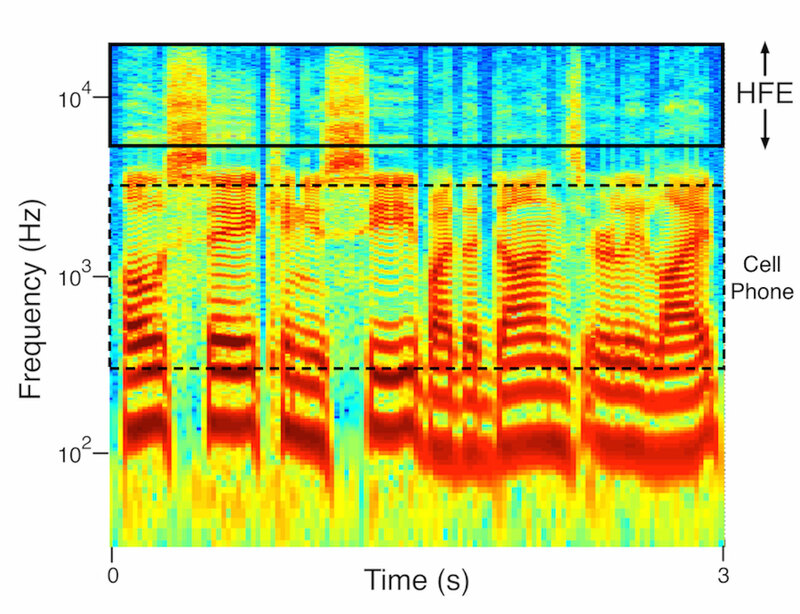 In fact, the high frequencies carry a surprising amount of information about a vocal sound. For example, could you tell the gender of the voices you heard in the examples? Could you tell whether they were talking or singing? Could you tell what they were saying or singing? (Hint: the words are lyrics to a familiar song.) Most of our listeners could accurately report all of these things, even when we added noise to the recordings. Figure 2. 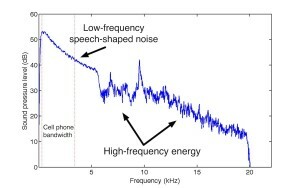 A frequency spectrum (on a linear axis) showing the energy in the high frequencies combined with speech-shaped low-frequency noise. What does this all mean? Cell phone and hearing aid technology is now attempting to include transmission of the high frequencies. It is tempting to speculate how inclusion of the high frequencies in cell phones, hearing aids, and even cochlear implants might benefit listeners. Lack of high-frequency information might be why we sometimes experience difficulty understanding someone on our phones, especially when sitting on a noisy bus or at a cocktail party. High frequencies might be of most benefit to children who tend to have better high-frequency hearing than adults. And what about quality? High frequencies certainly play a role in determining voice quality, which means vocalists and sound engineers might want to know the optimal amount of high-frequency energy for the right aesthetic. Some voices naturally produce higher amounts of high-frequency energy, and this might contribute to how well you like that voice. These possibilities give rise to many research questions we hope to pursue in our study of the high frequencies. Monson, B. B., Hunter, E. J., Lotto, A. J., and Story, B. H. (2014). “The perceptual significance of high-frequency energy in the human voice,” Frontiers in Psychology, 5, 587, doi: 10.3389/fpsyg.2014.00587.